MAKE WAY FOR THE SYNAPSIDS - er, Therapsids - um, Protomammals - I mean, Stem-mammals - uh... well they sure weren't REPTILES! Happy mother's day, paleo fans! Hope you all got mom something special. Because if she was a reptile, chances are that less than 1% of you would survive to adulthood! Now speaking of motherhood, it's time to honor the mothers (and fathers) of all mammals - I'm talking about those lovable creatures we call the Synapsids of the Permian period - a.k.a "that weird time before there were any dinosaurs which was full of odd animals nobody can pronounce but that are still cool ". Today we go on an artistic journey of epic proportions through the time of the Permian Synapsids, a group of transitional forms between reptiles and mammals - they have also been known as proto-mammals, stem-mammals, and (formerly) mammal-like reptiles. If you already are familiar with Synapsids, skip straight to the end of the post, because I have posted some new drawings of these creatures I'm working on. Nevertheless, curiosity seduces you and will not let go... so, onward! The Permian, for those of you who don't know, was the time period right before the Triassic, and probably the most turbulent and volatile time in the ENTIRE history of vertebrates - warm-bloodedness evolved for the first time, reptiles were easily ten times more diverse (and deadly) than today, and entire superclasses of animals appeared and largely went extinct all within a few million years. A totally new tier of food chains emerged, and cold-blooded reptiles would never again dominate the land. Ancient continents were colliding, the climate changed at rates that would even shock the CEO of ExxonMobil, and at least twice, the entire large-fauna ecosystem of the planet was killed and reborn. And when the Permian finally ended, 90% of all life on earth - both on land and under water - was gone forever. A miracle indeed that the direct ancestors of both dinosaurs and mammals survived unscathed, while larger and grander creatures dropped dead all around them. Some of the oldest and longest-surviving groups of creatures - familiar faces like giant lungfish, trilobites, crocodile-sized amphibians, and even large groups of winged insects, disappeared almost entirely. There are many theories for the extinction - from climate change to volcanism, to seismic activity from continental collisions releasing trapped pockets of toxic gases under the ocean floor, to changes in ocean currents and weather patterns, to interspecific epidemics after the formation of Pangea (i.e. the Cortez phenomenon), and yes, even that oft-repeated favorite of K-T catastrophists, the inevitable asteroid impact! Of course, if ALL of these things happened together, then the death of 90% of living organisms is not too hard to imagine. BUT, now let's go back to a time before the chaos, when the earth was rich and full of life, and life was simpler... (lol, I swear I'm probably ripping off the intro to one of Tolkien's stories without even knowing it). 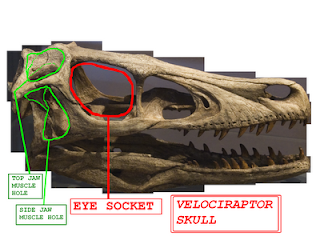 Here is the dirt on the Permian period and the Synapsids. Enter the Permian. And the Synapsids. Around 290 million years ago, the earliest reptiles (or rather, "stem-reptiles" with little similarity to today's artificially classified "reptile" groups - and still bearing a resamblance to their amphibian ancestors) - diversified into several types. *The Anapsids, had their jaw muscles entirely encased by a very compact skull. Thus there was not much room for muscle expansion, and they were restricted to developing short jaws and tiny brains - they sacrificed reach, leverage, and brain size to improve their limited biting power. They evolved into creatures like modern turtles, which all have short jaws with toothless beaks. 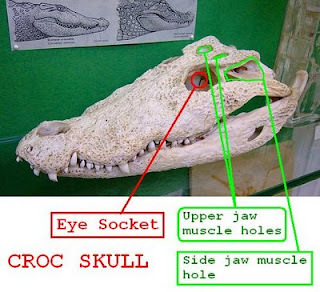 note the total lack of holes behind the eye socket. *The Diapsids developed two holes on either side of the rear skull, so that the jaw muscles that attached below could expand upwards and outwards without squeezing the brain. Many of the most successful animals in history have come from this lineage - Archosaurs, Crocodiles, Lizards (and subsequently snakes), Pterosaurs, Dinosaurs (and thus Birds) just to name a few. With the appearance of the first dinosaurs (and some would argue, even earlier Archosaurs) the Diapsida were permanently split into warm-blooded and cold-blooded classes. *The Synapsids developed one jaw-muscle hole on either side of the rear skull. 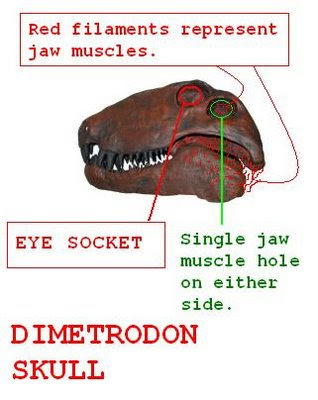 In the earliest versions, the Pelycosaurs (Dimetrodon and its kin), the holes faced sideways, allowing outward (but not upward) expansion of the jaw muscles. As the jaw muscles started vertically from the lower jaw, they were forced to curve outwards in early Synapsids - a rather crude configuration that required huge jaw muscles for any decent amount of power, and equally large spaces to contain them - and not much was left for the brain. Initially, despite having a stronger bite and more jaw leverage than Anapsids, the very first Synapsids were at a disadvantage to the Diapsids, because unlike Diapsids, they did suffer from "squeezed brains" whenever they bit something. The mammals, which successfully conquered the "squeezed brain" problem, are present-day synapsids, though NOT all Permian synapsids were closely related to mammals. 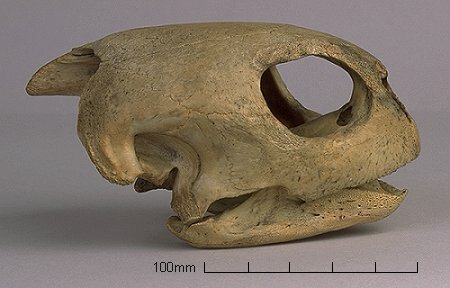 There was also a fourth group called Euryapsids, who had a single pair of jaw muscle holes like Synapsids, but in a different position relative to the skull bones. Euryapsids became aquatic, and evolved into Ichthyosaurs, Placodonts, Nothosaurs, and Plesiosaurs. But they are often today classed as simply an early offshoot of the Diapsids who lost the lower pair of jaw muscle openings. The science of early reptile origins continues to be problematic, murky, and hotly debated (and in my view, badly mismanaged) - and where Euryapsids truly came from is not so relevant to this post, so - moving on! 5. Caseidae (very slow, pin-headed plant-eaters with freakishly huge bellies, sprawling legs no longer than those of the other families, and seemingly no natural defenses except, in a few cases, SIZE). All of these groups were a leap forward from the Anapsids and proto-reptiles of the Carboniferous, but they still faced a problem - their cold-blooded metabolism made them slow and inefficient for terrestrial life, and their squeezed brains were an added disadvantage. But within a few million years, the early cold-blooded synapsids like the sail-backed Dimetrodon and Edaphosaurus were dead, replaced by the first warm-blooded synapsids - and the first warm-blooded creatures in the earth's history. They were likely descendants of one of Dimetrodon's Sphenacodontid cousins (some say it was certainly Haptodus, though I say "prove it!"). 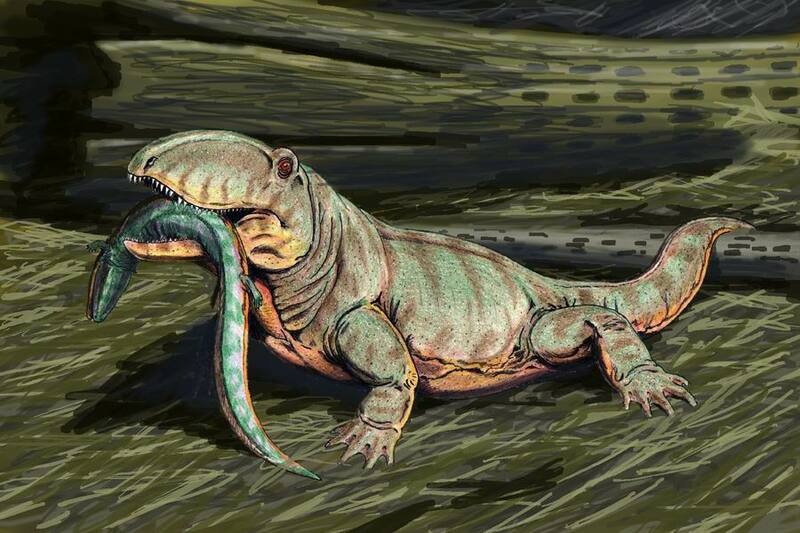 These new Synapsids were known as "Therapsids" ("beast-holed faces"). And their jaw muscle holes were rotated more upward than those of Pelycosaurs. Upward AND outward expansion in a single hole allowed the skull, mandible, and brain to grow wider and larger. The "squeezed brain" problem was history. A larger brain allowed for more development of the senses, including hearing. In the new Therapsids, the rear bones of the jaw slowly began to shift toward the ear canal, and developed into complex structures to aid hearing. It marked the transition between the reptile's single ear bone, and the three-boned inner ear of the mammal. The Therapsids, initially small and insignificant, overran the still cold-blooded diapsids and spread all over the Earth. Better hearing and sharper senses made these creatures better hunters. The world quickly became a scarier place. Not only did the independence of Therapsid predators from sun-basking allow them to decimate many early diapsids, but the Therapsid herbivores also outcompeted their reptilian counterparts, scaling steeper inclines and feasting in forests out of the reach of most reptiles. They became more erect than their sprawling ancestors, and some grew to huge sizes, with the biggest - such as the African genus Moschops, tipping the scales at over a ton. Not very big by dinosaur standards, but it dwarfed most every land vertebrate that came before it. Its biggest enemy was another Therapsid, the similarly huge Anteosaurus, a predator that was nearly mammalian except for its lack of molars. These creatures lived in the Kazanian epoch (which has been called by at least a thousand other names depending on which country you're from), a few million years after Dimetrodon. The Kazanian Therapsids, were true "proto-mammals". They had an erect or semi-erect posture, warm-blooded bone microstructure, and grew to large sizes quickly. The Kazanians were not known to have hair, but neither have scale impressions been found with them. Their skin type is unknown, but most artists conservatively restore them with non-scaly, naked skin like many large mammals today. There were both large and small Kazanians, but of course the big ones come to mind first. Their strongholds were high-latitude areas like present-day South Africa and Russia - areas which even then were relatively dry and had extreme climates, off limits to most reptilian cold-bloods. The Kazanians disappeared altogether within a few million years. Never again would Moschops graze the ferns of the Karoo basin. 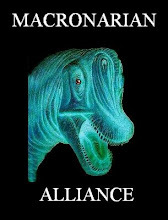 Nor would its Russian cousin Ulemosaurus ever roam the plains of Kazan. Only some of their tiny and very distant cousins survived. The Dicynodonts, a branch of a insignificant family of small Kazanian therapsids that lived in the shadow of the Moschops-like forms, weathered out the mass extinction and grew larger to fill in the niche of top herbivore. They also did away with the incisors of their ancestors and grew tough beaks for grazing, as well as tusks for fighting. The top carnivore niches were filled by the Theriodonts, a cluster of three groups of fast, fanged, and probably hairy predators: Gorgonopsians, Therocephalians, and Cynodonts - the group which branched off into the first mammals. Various Tartarian therapsids - those with deep snouts and long fangs are Gorgonopsians. This epoch of lumbering, beaked plant-eaters and furry, wolf-like hunters was called the Tartarian (again, it's ridiculous how many other names this timespan has been given in different countries). The Dicynodonts and the three clans of Theriodonts managed to fill nearly every niche the Kazanians had left vacant. Yet this time of diversity was also beginning to be plagued by a global decline. The continents were joining together as tectonic plates collided. Increased volcanic activity, earthquakes, and warmer ocean currents emerged, and the weather patterns became increasingly dry, leaving the newly-formed supercontinent Pangaea a barren wasteland. Fish stocks plummeted. Amber deposits from that time indicate the presence of huge amounts of deadly hydrogen sulfide gas, perhaps from increasingly disturbed undersea volcanoes and fissures. The Tartarian Therapsids may have simply choked to death on fumes. And - well, we can never rule out the possibility of an asteroid for good. Gorgonopsians, like the saber toothed cats that mimicked them much later, went the way of - well - the Dimetrodon! The ancient trilobites in the sea bit the dust after nearly 300 million years of survival (including at least two earlier mass-extinctions). The water was too toxic for most fish and shellfish. And on land, the warm-bloodedness of the therapsids, which had ensured their supremacy for millions of years, placed costly energy demands on them that doomed them to certain destruction in a continent increasingly parched and devoid of food. The smallest of Cynodonts, Therocephalians, and Dicynodonts were the only therapsids that survived the annihilation of their once grand clade. The diapsid reptiles, on the other hand, flourished. They quickly evolved into a group called Archosaurs, whose first wave, the Pseudosuchians or "False Crocodiles", dominated the land and eventually the water as well. From the big headed Rauisuchian carnivores, to armor-plated hebivores like the Aetosaur Stagonolepis, to crocodile-mimic Phytosaurs, and even true crocodiles themselves, the Archosaurs did the Therapsids one better - they managed to survive in Pangaea without true warm-bloodedness, and often grew to large sizes that would retain heat without needing to move and eat constantly - the so-called "lukewarm metabolism" or mass-homeothermy. The crocodiles, following the Phytosaur model, became patient river ambush predators and gave up any semblance of energy-hungry warm-bloodedness entirely, though they still retained four-chambered hearts. The Archosaurs as a whole became an entire ecosystem, diversifying to fill every niche, until the Therapsids were beyond hope of survival. The few remaining therapsid families to survive the Permian mass extinction had paid a high cost. Much of their foothold on land had been lost to Archosaurs. Pushed by evolutionary competition, a few cynodonts were desperately beginning to show potential aquatic tendencies, but before they could evolve to populate the rivers, the Archosaurs had already filled those niches - and wiped out these "proto-otters" before they had a chance. The Dicynodonts once again emerged and grew to huge sizes rivalling the long-dead Kazanians, but their best days were truly behind them. Their warm-blooded metabolism did not automatically translate into speed or agility, and many of them were too ravenous to survive in low-biomass areas (where reptiles thrived), yet too ponderous to outrun the big predators which often hid in more lush, dense vegetation. Slow and ungainly, they became fodder for fast-moving Rauisuchian hunters. Once the Pangaea climate became more stable, the Cynodonts downsized and evolved all the basic features needed to become true Mammals, submitting until further notice to the terror of the larger and stronger Diapsid nemesis, while the over-specialized Dicynodonts, relics of a bygone era, were unwittingly wiped out in the Archosaur-dominated frenzy. The Triassic Takeover: Archosaurs (in black) drive the Cynodonts and Dicynodonts (in white) into extinction in every major herbivorous and carnivorous niche. Near the top you can also see some early dinosaurs like Dilophosaurus, Heterodontosaurus, and Plateosaurus. Within a few more million years, the Archosaurs, who had driven the therapsids to the brink of extinction, were themselves threatened by a group of their seeminly insignificant (and strangely bipedal) relatives - the first Dinosaurs. And when warm-bloodedness re-emerged in full force with the dinosaurs - it was here to stay. Inostrancevia was the largest of the Gorgonopsians, hailing from Russia and growing to the size of a large bear. Its prey included the even more massive Scutosaurus, a huge, slow Anapsid reptile that ate ferns and other low-growing plants. Inostrancevia has long been m y favorite protomammal ever since I saw the PaleoWorld series on TV back in 1995 (and for those of you that remember it... that show was an absolute masterpiece in every way). And I always imagined Gorgonopsians - the big ones anyway - to have been pack hunters like lions and wolves today. Now some of my more conservative colleagues will say "no, they didn't have the brain power to coordinate a pack hunt" or "they were just too primitive to pull it off" or "why the hell are you giving them fur and whiskers and the ability to jump?". These are empty complaints at best. Remember, my intention is to show them as believable living creatures, based on the best current information about their anatomy and phenotype - not as an outdated monograph of some naturalist textbook from the Darwin era. Much of the prejudice against pack-hunting protomammals comes form the outdated assumption that they were cold-blooded reptiles. But even most warm-blooded predators today are not pack hunters, and ironically, cold-blooded crocodiles and monitor lizards will swarm a struggling victim even though they are not launching a pre-meditated strategy - and they do not compete with each other until after the prey is dead. 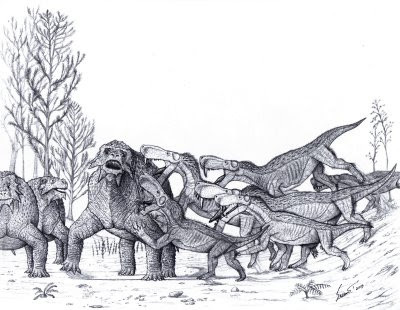 Even the most primitive therapsids would have had at least that much collective hunting ability. And of course hairy Gorgonopsians look far more beautiful than scaly ones. This is clearly a work in progress. I deliberately over-darkened this image (as you can tell from the filled-in portion of the cheek flange) so the outlines would become more visible. I'm obviously nowhere near finished on this one, and it took a lot of wrangling with various photographs and estimating the skull's uncrushed shape, to finally get the proportions right. I plan to put a lot more textured detail on the "crown" and the cheek flanges. Estemmenosuchus mirabilis was a Kazanian epoch therapsid, a relative of fellow-Kazanian Moschops, and almost as big. Both creatures belonged to the suborder Dinocephalia, and were among the earliest creatures adapted to ritual head-butting behavior. Their new status as warm-blooded animals meant more energy for mating rituals and more competition among males. While some Dinocephalians, like Moschops and Ulemosaurus, simply grew thickened skull domes, Estemmenosuchus took headgear in a far more radical direction. It had two ornate crown-like bone structures above the eyes, two huge horizontal cheek flanges, large fangs (certainly for fighting, or else this creature, which had the back teeth of a primitive plant-eater, may have actually been an omnivore) - and it even sported a small nose horn, a feature that would not re-emerge until the heyday of the Dinosaurs. Out of all these structures, the cheek flanges were the largest. Another species, Estemmenosuchus uralensis, had smaller and rounder flanges (some suspect the two species are simply males and females of the same animal). The "third eye" (actually a scale-like gland) was also large. There is a scarcity of decent restorations of this beast. In fact, I can recall only ONE picture of Estemmenosuchus that really looked believable to me, and that was a vivid gray-and-red painting by David Peters done for a monumental timeline-book of dinosaurs and other extinct animals. The book is almost certainly out of print, I don't remember the title, and the painting is nowhere to be seen on the web (David Peters himself, though a very talented artist of the first caliber, seemingly ruined his career by promoting some wildly speculative and unscientific restorations of Pterosaurs which the paleo-art world has done its best to avoid and disown - though I prefer to remember the far better work he produced in the 90's). 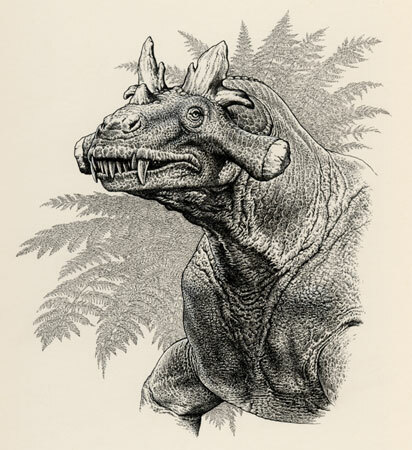 They both have the same flattened appearance and straight-edge lips to the skull, which matches neither the fossils nor the original monograph engraving (shown HERE). And both restorations also ignore the fact that large Dinocephalians had a sharp head-neck angle - so that Estemmenosuchus rarely (if ever) held its head with the snout pointing straight forward like that. Like Moschops, its head was held nose-down: a perfect all-purpose position for feeding, drinking, charging, and head-butting. Sibbick and Pastori would do well to look closer at the actual skeleton and how it articulates. 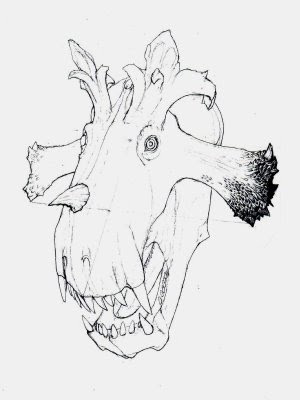 So I will be following the actual skull far more closely, to produce a completely original (and far more accurate) drawing of Estemmenosuchus. Based on the scar ridges on both the dentary and mandibular regions, this animal also had primitive cheeks - whereas all extant "restorations" (like Sibbick's and Pastori's) lack them entirely. Cheeks, after all, started out both in mammals and dinosaurs, as humble extensions of the jaw adductor muscles, which were already quite prominent in the earliest Synapsids. Here is a skull photo (I've had to enhance some details and shading due to the bad resolution, but rest assured I didn't add any features that weren't already there). 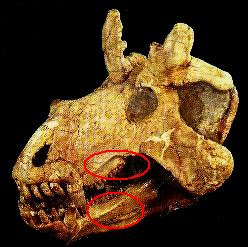 Estemmenosuchus mirabilis skull - red ovals clearly indicate where the attachment ridges for the cheek muscles are. These early cheeks probably did not have as much capacity as those of modern mammals, but Estemmenosuchus certainly did not have naked gums or skinny lizard lips. However, it evolved its cheeks independently of true mammals (i.e. Cynodont descendants). Next week it'll be back to the dinosaurs, but I hope to finish Estemmenosuchus and some other therapsid images pretty soon. So keep checking this post. Just thought I'd let you know that Estimmenosuchus is featured on the cover of A Gallery Of Dinosaurs & Other Early Reptiles as well as in an interior piece. I also believe he had a rendering of Estemmenosuchus in his Strange Creatures book. You can find both of 'em used on Amazon or ABEbooks. Yeah, I agree with you on that "neon purple" comment. A little too "Barney-esque" for my taste. Yeesh! Anyway, can't wait to see what else you have in store. Hoping for a bit o color in more of your work. That Tarbosaurus is amazing. Hey did you know that Estemmenosuchus was the first animal to have a nose horn. I'm an evolutionary biologist from Australia and I just wanted to say you're doing a beautiful job of communicating the evolution of these organisms to a general audience (something that most scientists struggle with). My son has not outgrown his love of dinosaurs and has started drawing them and making up his own versions. He can't get enough of dinosaurs and I've been struggling to find content that isn't just for toddlers or adults. There doesn't seem to be a lot for the preteen and teen years (he's 11yrs old). He was fascinated with your art and really enjoys what you have up here so far. I hope you keep it up and keep posting! Nima: I found this written summary very helpful. I am researching / writing a world history myself, and it's difficult to find good clear accounts of Mesozoic non-dinosaur evolution outside of monographs. I will post my account of this time period this summer as Chapter 8, which stands for 10^8, or 100,000,000 years ago. I mostly use images from public domain or Creative Commons. Let me know if you have any favorite images of creatures that were closely related to human ancestors. I am especially interested in basal examples of pelycosaurs, therapsids, cynodonts, mammals, theria, primates, and simians.